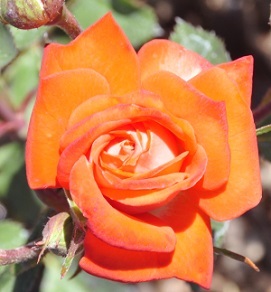 Torch of Liberty Miniature Rose was introduced by Ralph Moore in 1985. 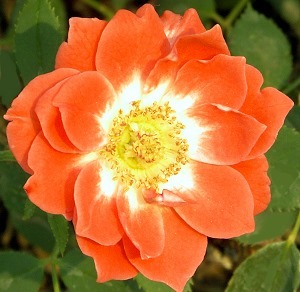 The cantaloupe orange flower petals are washed with cream on the back side and at the center. It can grow to a height of two feet and can get equally as wide. The flowers come and go throughout the growing season an are usually in clusters of six or so. The informal hedge below is about three years old and is six plants. The taller rose in the background is Why Not Miniature Rose. Torch of Liberty Miniature Rose has perfectly shaped buds that are ideal for drying or using in fresh crafts like our fresh Herbal Wreath. It would make an excellent addition to our Crafter's Herb Garden Six Pack.